One month after the App Store debuted, Nick Wingfield of The Wall Street Journal sat down with Steve Jobs to see how it was going. Today, The Wall Street Journal released a full transcript and audio of the interview on their site. The interview is behind the Journal’s paywall, but it’s worth a read or listen if you have access to it. 27% of them are free, leaving 73% paid. Of the paid apps, over 90% are under $10. Users have downloaded over 60 million apps from the App Store in the first 30 days…. That is 30% as big as iTunes for music downloads. The total revenue has been $30 million in the first 30 days. Developers get 70% of that. Developers get $21 million. Nine of that $21 million is going to the top 10 developers. A lot of small developers are making a lot of money. We’re already at a $360 million a year run rate. This thing is going to crest to half a billion soon. Who knows? Maybe it’ll be a billion dollar marketplace at some point in time. This doesn’t happen very often. A whole new billion dollar market opens up. 360 million in the first 30 days, I’ve never seen anything like this in my career for software. 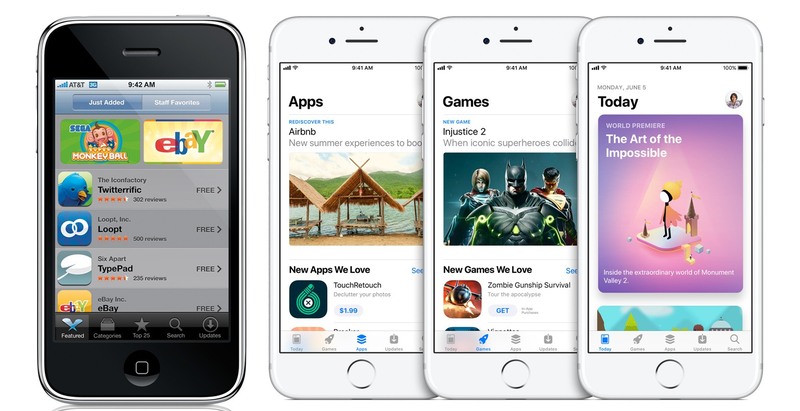 Although I’m surprised that The Wall Street Journal waited more than two weeks after the 10th anniversary of the App Store to release the interview, I’m glad they did. The interview is full of interesting facts about the early App Store and a unique insight into Steve Jobs’ reaction to the Store’s runaway success. I highly recommend you listen if you can.